Tangible Dreams - Game development - tutorials, blog, and game showcase. Last weekend, the Alakajam held its first 48 hour game jam event, with the theme of Alchemy. I participated, and created a new game: "The Hermetic Order of Alchemists". This time, I decided to make a puzzle game, about transforming and purifying alchemical substances. As in previous game jams, I created the game in Java, using the LibGDX framework. I made the pixel art using Aseprite, and I made the music using Bosca Ceoil. The game mechanics center around manipulating a number of different substances. You do this by breaking them into their component elements, getting rid of surplus elements, and then reassembling the remaining elements into different substances. Each puzzle is presented as a trial, with a given starting number of substance, and a goal you need to reach. Then, using the tools at your disposal, and your knowledge about the properties of the substances, you have to transform your starting substances into the end goal. Each substance has a breaking point. This is the hot temperature where it splits into its contained elements. It also has a binding point. This is the cold temperature where it forms from available unbonded elements. And finally, it has a reactivity rating. This determines the priority of this substance forming, if there are enough available elements to form several different substances. In short, "The Hermetic Order of Alchemists" is a logic puzzle game. You have to decide which substances and processes that will lead you from your starting point and to your goal. I tried to make each puzzle build upon the earlier puzzles. So while you can get through the earlier puzzles through trial and error, this will make it a lot harder to get through the later puzzles. Despite only having 48 hours in this jam, I still found the time to make sounds and even a musical theme for the game. As an extra touch, I added a little voice acting to the game, lending my voice to the annoying Master of Alchemy who are clearly not rooting for your success. Try "The Hermetic Order of Alchemists" now! I participated in Ludum Dare 39 this weekend, and made a new game. Just as last time, I decided to participate in the 78 hour Jam instead of the 48 hour Compo. While I was still adhering to all Compo rules, this meant that I could make a strategy game, and still have some time left for polishing the final game. This time, the theme was "Running out of Power". During my brainstorming, I decided to interpret the word "power" as political power. From that, I then decided to make a game about overthrowing an oppressive government. The player weakens the regime by converting the population to their side, which ties in with the "Running out of Power" theme. As in my previous LDs, I developed the game in Java, using the LibGDX framework. Due to the scale of the idea, I decided that the genre of the game should be a strategy game. 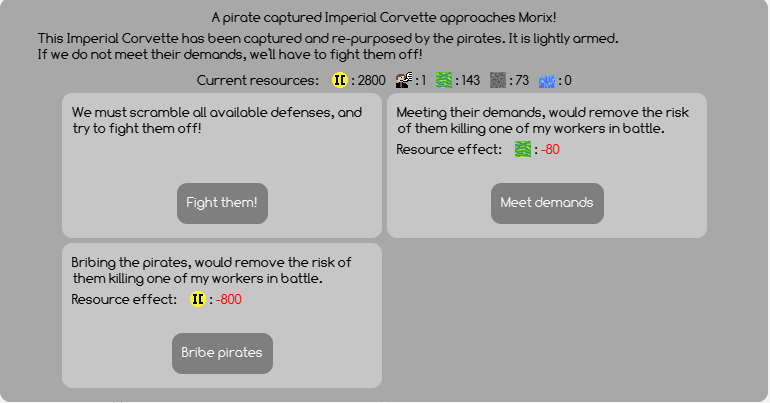 Since that genre is more complex, I also decided to keep the mechanics simple, by implementing the game as a "one action per turn" turn-based game, with alternating turns between the player and the AI-controlled regime. In my original brainstorm, this would happen by gradually taking control of various government departments, and then finally confronting the leader. But with a bit of prototyping, it became clear that this would take too long to implement properly. Instead, I simplified the scope a bit. I kept the "population as a resource" element from my initial concept as the core element of the mechanics. As the game goal was still to overthrow the regime, I also needed to decide how to create that as an antagonist. Keeping the idea of overcoming multiple obstacles from my initial brainstorm, I decided that the antagonists should be three overlords instead of one. 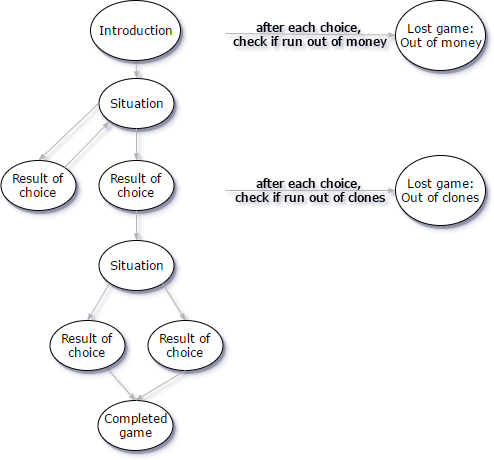 By performing this simplification, the game concept was distilled into two aspects, that the game mechanics needed to cover: A way to get/lose the resource of the game (i.e. the population), and a way to defeat the antagonists. The base mechanics in my turn based game, was to let the player choose one action per turn. So I mapped these two aspects directly into the actions that can be performed. Firstly, a category of actions that affected the population resource, i.e. gaining control over them, making the opponent lose them, or removing them from the game entirely. And secondly, a category of actions used to affect the antagonists. The antagonists respond after each turn. Their actions affect the population in the same way as the player. I.e. taking control, making the player lose control, or removing the population from the game. This also introduced a lose-condition. The game is lost if the antagonists control all remaining population. I decided, that each type of action would have a base percentage change of success. 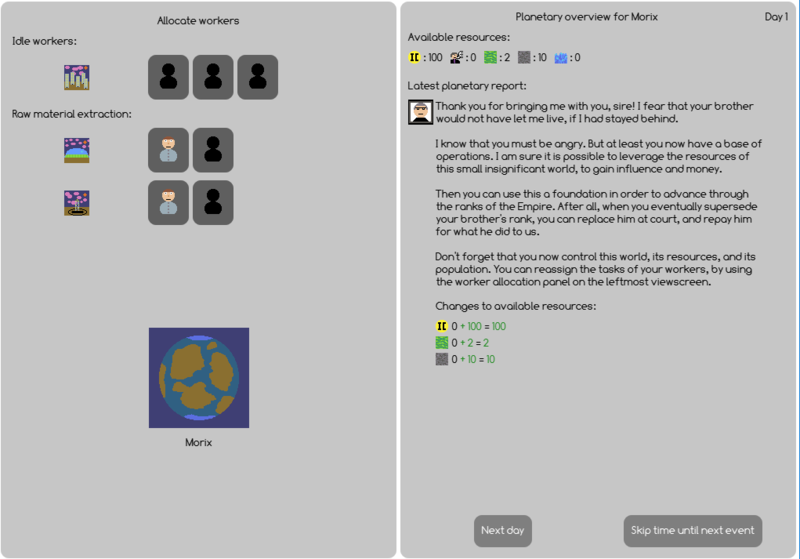 In order to have a purpose for the population resource, this chance is boosted the more population the player controls. It is also lowered by the amount of population controlled by the opponent. Lastly I added some extra features for variety. Each round has a random type of action gain a bonus, if attempted. The antagonists' chance of success become higher over time (reset by a successful action performed by the player). And you can perform "investigate"-actions against an antagonist, which give a small permanent bonus to later attempts to depose him. 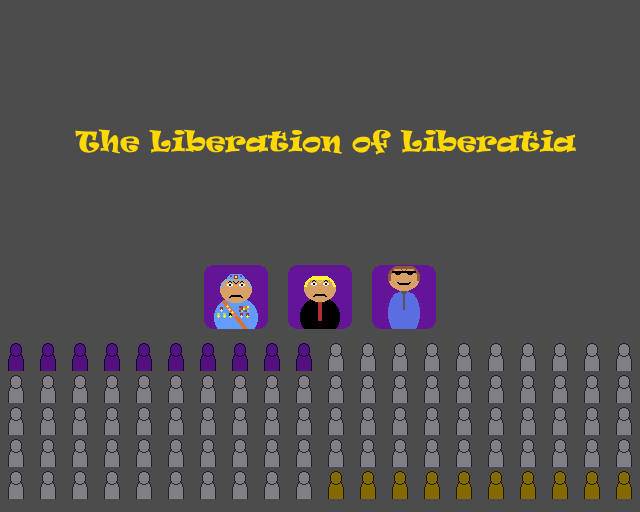 Try "The Liberation of Liberatia" now! Author SomniumPosted on August 2, 2017 August 2, 2017 Categories My Games, PresentationTags Java, LibGDX, Ludum DareLeave a comment on Ludum Dare 39 - "The Liberation of Liberatia"
A text-based "choose your own path" game, made in Java LibGDX. For my May #1GAM entry, I have created a short humorous "choose your own path" style adventure game called "Above Your Clearance", using Java LibGDX. In the game, you play as a Citizen in an oppressive society, who are unlucky enough to be selected for an important mission. You then have to navigate through a series of decisions. And you need to do so, without running out of credits or clones (extra "lives"). The setting is loosely based on a tabletop roleplaying game called Paranoia. I intend to use it as an introduction to new players of this game, as a sort of "primer" on the tone of such games. My focus this time was to build a "data-driven" game: Every game location is displayed using a single reusable UI. 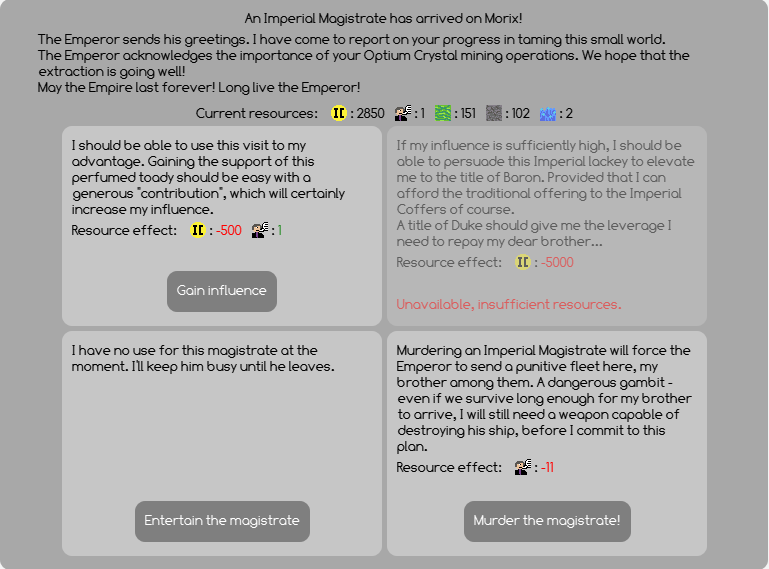 The content of this UI is then changed dynamically, as the player progresses through the game. The game objects are implemented as objects with data, but without game logic. An example of this is the Effect object, i.e. what happens when the user chooses a specific choice. It has a type (which is the kind of effect it has on the world). It also has a corresponding magnitude. But it contains no logic about how to apply itself to the world. This means that Effect objects can be defined as data, e.g. in an external data file, or through an external editor. The game logic is instead handled by the core game logic. Here, specific functionality is excecuted, depending on the type and magnitude of a given effect. Additionally, I made a few more experiments with the Scene2D GUI-api, including building some custom Actor components, that are easier to change dynamically during the game. This ended up working rather well. As I did for my latest LD-game, I also made a HTML-version of the game. The game should scale for both high-DPI and normal-sized screens as well, which also took some experimentation. Try "Above Your Clearance" now! The following Post Mortem contains my reflections on what went well, and what did not go as planned, during the creation of The Morix Colony, my recent Ludum Dare 38 submission. The Morix colony is a turn-based strategy game, in which a young nobleman was banished from the Imperial Court by his older brother. He was sent to the small remote planet of Morix, to act as its new governor. Using the resources of his new world, he will extract raw materials, amass wealth and influence, upgrade the colony, and fight off (and/or bribe) marauding space pirates. Eventually, he will become powerful enough to be able to repay his brother for the injustice. It was made in my sixth Ludum Dare, and was my first time participating in the Jam instead of the Compo. Story - I’m glad I took the time to work out a story as my first task, as it gave the player a specific goal to achieve. At the same time, it gave me a contextual framework for all the other writing in the game. This meant that I could frame all the other events, resources and NPCs in terms of how it helped the ambitious main character in achieving his goal. Participating in the Jam - I usually participate in the Compo, but this year I decided to participate in the jam instead. I followed the same restrictions as the Compo, but for the extra time. I really enjoyed having time to make some deeper gameplay, a proper story, and a more polished end result this time. Content - I am happy with the amount of content I managed to include in the game this LD. I managed to include a variety of gameplay elements and resources interacting with each other. I had time for a greater variation in the writing, and even made two different endings. 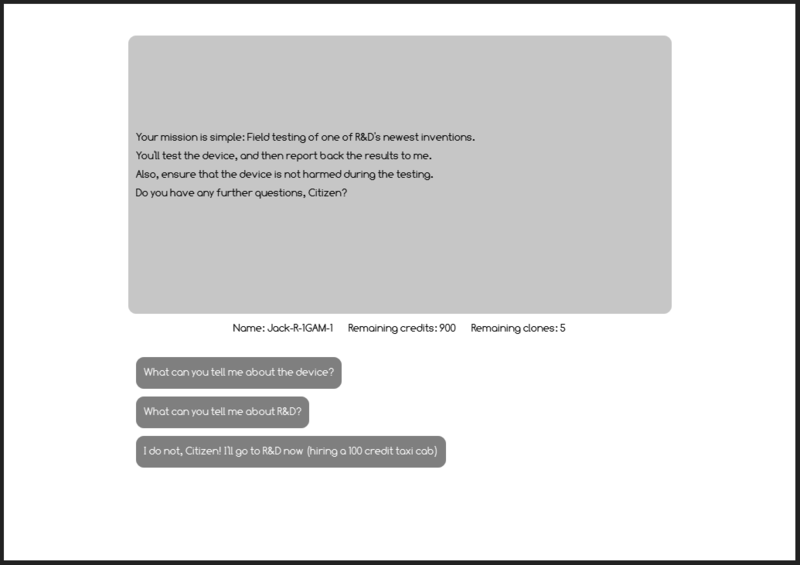 I also managed to implemented a good deal of reactivity: The NPCs addressing you differently depending on your reputation and social status. The random events changing if you become a criminal (or as a result of various actions through the game). And your advisor has different reaction facial expressions, depending on the news of the round. Just to mention a few. Mechanics - I am quite satisfied with the mechanics I implemented. The interplay between the resources, the colonist allocation and the random events worked out pretty well. The gameplay naturally evolves into three different phases: Forst a survival phase in the beginning, where death could come swiftly. Then, this is gradually replaced by gaining traction, as you start to be able to buy upgrades, and are able to take advantage of the positive random events. And then, finally the feeling of power and stability, as you amass wealth and resources in preparation for victory. I also think I hit upon a good number of different resources. They behaved similarly in some respects, but also had unique uses to justify their separate existence. UI - I was pretty satisfied with how the UI turned out. It seems that the tooltips in particular, worked well in explaining the game mechanics. I also feel that I struck a good balance between gameplay complexity and a simple interface. I also wanted to have tracked the colony upgrades in the UI, but I did not have the time to make the icons, so that instead became part of the end-of-game score. Scope - My scope ended up a bit too large. I had to cut a few features, like extra facilities and upgrades that would have given the player more control over the random events. For instance the ability to assign colonists to defense, or to operate a radio facility, which would allow finer control over the probability of the random events. I’d liked to expand upon the mechanics even further, with a few more facilities, upgrades, and events for variety’s sake. Early game - The early game suffered a bit from the cuts mentioned above. In the beginning, before you have built up a stockpile of resources, there is not a lot to do, except for advancing the clock, and hoping for some good random events, to be able to survive the pirate attacks. I had originally planned for an extra “game phase” in the beginning. There you would spend your first turns building up the colony. This would culminate in the construction of a space port, and mark the beginning of getting the “visitor” random events. Instead, I tweaked the pacing of the beginning, so that you have to balance your growth with being able to keep the pirates at bay. But the randomness of this phase felt frustrating to some players. Content - While I built a lot of reactivity and details into the game, I think I should have adapted this effort to the kind of event that Ludum Dare is. The time spent on multiple endings, and creating a lot of subtle details that will only be seen after playing for quite a while, could probably have been better spent on improving the early game experience. Tool-familiarity - I made the game using Java and LibGDX, which is my usual tool set. But this time, I ended up spending several hours on Saturday, on experimenting with mouse-over, and drag and drop functionality. I should definitely have practiced more on using the UI-toolkit before the event itself. No music or sounds - Every LD I want to make some music and sound, but in most of them I fail to allocate the time for it. For sounds, I usually use BFXR, but I think I have to find a simple music tool without a daunting amount of features, much like the simplicity of Aseprite allows me to make functional pixel graphics. If you know of any such music creation tool, I’d appreciate it if you would leave a comment! This has been one of my most enjoyable Ludum Dare events so far. Due to the extra time from the Jam, I had time to experiment with some deeper mechanics than usual. I was also able to spend more time on the writing and story, and to create a user-interface that feels more “alive” than in my previous games. I’ve also enjoyed the post-LD gaming, I feel that I’ve played some real gems this time! Ludum Dare 38 - "The Morix Colony"
As I have a few days off this week, I decided to participate in the Ludum Dare Jam this time. My intention was, that the extra time would give me the opportunity to create some more substantial mechanics. And as an extra bonus, that I would finally have the time to make some sound and music for my game. The theme for this LD was "A Small World". I did not find this theme to be very inspiring, to be honest, but after brainstorming for a few hours, I did manage to come up with an idea: The player is a former noble in a galactic empire. He is banished to a small and politically insignificant world (applying the theme in both a literal and a figurative sense). From here, he has to amass enough money to bring him back to the imperial court. He does this by managing the resources of his small colony. The game therefore ended up as a turn-based strategy game. The player allocates his population to resource production, which accumulate over time. And at semi-random intervals, he will be presented with random events, where he has to make a choice about what to do. The types of events vary: Sometimes the player gets an opportunity to buy or sell a specific kind of resource. Sometimes, with sufficient resources, he can upgrade his colony in various ways. And sometimes, he is threatened by hostile space pirates, demanding tribute. The gameplay is somewhat similar to "The Organization", which is one of my previous LD-games. However, this time I had extra time from participating in the Jam rather than in the Compo. This allowed me to better balance the random events and resource allocation elements. I made the game in Java, using the LibGDX library. 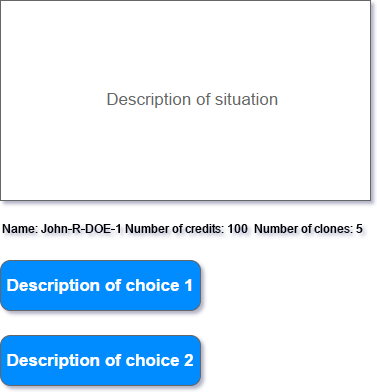 This time, I focused on experimenting with the Scene2D GUI-api. Try "The Morix Colony" now! Author SomniumPosted on April 25, 2017 May 1, 2017 Categories My Games, PresentationTags Java, LibGDX, Ludum DareLeave a comment on Ludum Dare 38 - "The Morix Colony"
Author SomniumPosted on January 31, 2017 December 4, 2017 Categories My Games, PresentationLeave a comment on Creating a game each month for a year? 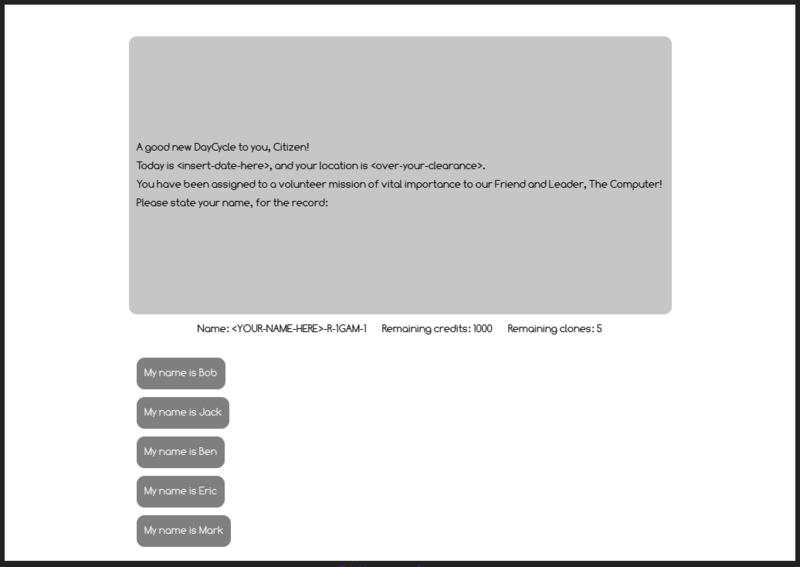 I've joined 1GAM!